EA Mobile has announced the newest update in its popular life simulation game The Sims FreePlay. Entitled “Pet Paradise,” this update introduces a new location for pets to explore within the game, new hobbies themed around cats and dogs, a new personality type for animal-loving Sims and new accessory items to purchase in the game’s Pet Salon. First things first, players Level 26+ can build the Barkshire Pet Park on the world map. This area is located across the bridge from town, near the coast. This area comes with tools for enjoying the game’s new hobbies, as well as a Cat Cafe for Sims to relax. As part of this update, Sims can train their dogs to perform tricks through the new Dog Obedience hobby, or train them to complete obstacle courses in the Dog Agility hobby. Cat lovers, meanwhile, can groom their kittens and practice the new Cat Show hobby. A Cat Run is also available for cats at the Cat Cafe. If you want a Sim to really show off their animal-loving personality, they can be given the Animal Fanatic personality type. Finally, new collars can be purchased from the Pet Salon. 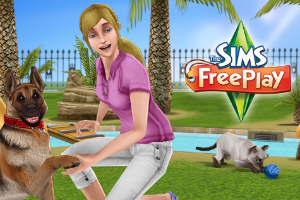 In addition to these pet-themed updates, The Sims FreePlay has been given a “new and condensed” tutorial system for new players, which will help them jump into the game with greater ease.